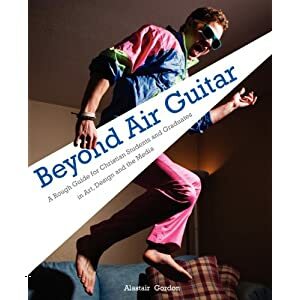 Marketed as "a rough guide for Christian Students and Graduates in Art, Design and the Media", Ally Gordon has provided a really helpful workbook for all of you thinking about the nature of being a Christian and an artist. From the big questions like 'What is Christian Art?' to 'How is Art worship', as well as some great chapters on what the Bible has to say about it all, this book really is super practical, helpful and insightful. There's a great section at the end of the book as well with artists being interviewed about being a Christian in the industry, from the likes of Norman Stone to Interface graduates, as well as hands-on advice on the reality of pursuing a career in the arts after college. What excited me as I read this book was the freedom we discover in the Bible to be creators, and to enjoy pursuing being made in God's image and working for God's glory. Ally used to do mine and Craig's job for UCCF and so a lot of the material has come out of questions you guys have been asking for the last few years! Ally now works part-time as a painter, and also for Morphe Arts (formerly known as Interface Arts Graduates). If you're graduating this coming year, do check out Morphe as your next port of call - it's a really valuable network of like-minded Christians in the arts.